MD Jasminka Komnenović is a member of Medical Chamber, Serbian Medical Society, Pediatric Association of Serbia, ESPEN (European Society for Clinical nutrition and Metabolism) and community of health professionals in the field of pediatric nutrition “Nutrition & growth Network”. Ordination “Dr Komnenović” is specialized ordination for pediatric and nutrition. It was founded in 2005. Ordination provides services of specialist examination and counseling. Nutrition support to parents is provided based on systematic examination, which among basic pediatric examination includes more comprehensive diagnostic procedure. Considering most frequent users of abovementioned services, two main segments stand out, especially in counseling field: children’s nutrition and pregnancy nutrition. A years of experience resulted in handbook “Since first meal till school snack“, which presents professional and empirical bases for defining a kind of guide through infant’s and kind nutrition. A chief physician Jasminka Komnenović is internationally recognized pediatrician and nutritionist, with large number of scientific and professional references. After graduation on University of Belgrade, School of Medicine, MD Jasminka Komnenović she finished her specialization in pediatric in 1993 year. Sub-specialization in healthy and sick children she finished in 1996, and Sub-specialization work „Predisposition factors of obesity among infants“ was defended in 2000. A year later, she got chief physician title. Most of her professional work, she has dedicated to ambulatory pediatric. MD Jasminka Komnenović is one of a very few in this region, who is dealing with prevention and problems regarding infants’ and children’s nutrition. Book “Since first meal till school snack” by MD Jasminka Komnenović, is bestseller its this category, it was proclaimed as a leader in the region, which provided an interest of foreign publishers to publish it in their own language. MD Jasminka Komnenović has published and presented dozens of professional and scientific works, mainly in children’s nutrition field. She attended numerous congresses and symposiums, as well as other professional conferences, dedicated to the general pediatric and infant’s and children’s nutrition. 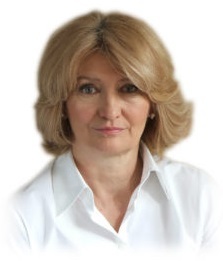 MD Jasminka Komnenović has published significant number of professionally educative columns. She speaks English. She is married and has two children. Dr Komnenović © 2016. Sva prava zadržana.